Semi-Boite Nature varnished, with brooch, 12 cuban cigars put in a horizontal position in four groups with a silky ribbon. This "rookie" is here to stay! 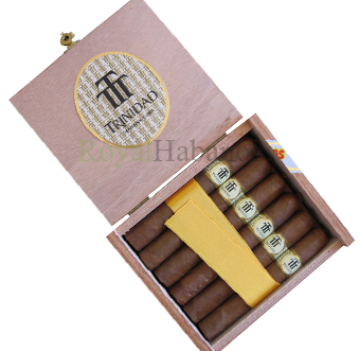 A new adition to the Trinidad family, and by the looks of it its a very handsome family indeed. I tried one of these recently and was suitably impressed! The strength is intelligently measured gently releasing the aromas of woody spices mixed with coffee in a deep, confident smoke. Interesting! Cigar box 12 Trinidad Reyes Cuban Cigars.